In 2016, I attended the Alliance of Artists Communities (AAC) conference in Portland, Oregon, and wrote about the important take-aways from the impactful week. The lessons I learned apply not only to the artist community world, but to the greater art and contemporary craft fields. This series was a feature on my Crafthaus blog, The MFA Guidebook for Studio Artists. 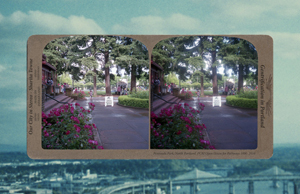 Postcard by Sharita Towne for the Exhibition Our City in Stereo, presented by Newspace Center for Photography in partnership with c3:initiative. Community engagement and social practice are becoming more common in the art world and, frankly, have become something of a trend. The topic has been spoken about increasingly as an important initiative for artists communities, and I see it frequently in the practices of the artists-in-residence where I work. The craft community is seeing glimpses of it as well – in the Jewelry/Metals field, which I am most familiar with, at the 2015 SNAG conference in Boston with the “Social Impact” presentations by Sam Aquillano (speaking about Design Museum Boston), Gabriel Craig, Michael Strand (a ceramicist), and Jason Talbott (speaking about Artists for Humanity). It’s a great trend – artists connecting with the community is an excellent vehicle for social change – but it’s one that can be not-so-great or even harmful when approached superficially or without careful consideration. During the session in my previous post, “Self-Declared: Practice and Politics of DIY Artist Residencies in Portland,” our group discussed the difficulty of reaching the underserved members of our communities. I was particularly impacted by the words of Betty Marín of 18th Street Arts Center. Betty emphasized that effective community engagement should not necessarily come in the form the artist envisions – which often comes from a place of social, racial, or economic privilege – but rather should come from the underserved community members themselves. This may manifest in more practical ways, such as providing childcare for community engagement events, or by providing art education in the form of skill-building services to support career growth. Her words opened my eyes to the meaning of social practice. I realized that artists who desire a practice of community engagement cannot decide themselves what the community needs or how they can best engage. The artist needs to invite the community members they wish to reach into the discussion, and allow them to define their needs and how they’ll best be served. That should be the starting point, and the rest should grow from there. Another session I attended, “Arts and Equity in the Neighborhood,” expounded upon this theme. A major focus in the session was gentrification and how each of us are individually implicated. We were instructed to be honest with ourselves about the role we play, and to speak from “I” statements, rather than making assumptions about others’ experiences. It was pointed out that even an arts organization in a gentrifying neighborhood can play a negative role in the fact that it appeals to a comparatively wealthy white population, and that it is important for those organizations to partner and collaborate with existing community organizations that directly serve the original community in a constructive way. A reverberating quote from the session was, “If you’re not at the table, you’re on the menu,” meaning that if members of the underserved population are not included to have a voice and an input – if you’re making assumptions about what they desire and need – then they are being consumed, meaning both drowned out and profited from. This is so important to keep in mind, particularly when we have the best of intentions. If you are creating work or working in the realm of social practice – no matter how loosely defined – make sure you are either speaking from your own experience, or bringing those with the experience to speak for themselves. Be open to the fact that your initial ideas may not work, and that you may have to adapt or hand over control completely. If you can’t do that, then consider why you are making the work. If you’re making it for yourself, then make work for yourself and call it what it is. There’s room for that kind of work, too. But if you’re making work to benefit someone else, make sure it is actually achieving that goal.